General Description: It is a biennial to sometimes annual or perennial herbaceous plant. As a biennial, tansy ragwort spends the first year in the rosette stage with dark green basal leaves that appear ruffled. During the second year, one or two flowering stems form. Flower Description: Flowerheads are in flat topped clusters. Flowerheads yellow with many disk flowers and 13 ray flowers, overall flowerhead daisy-like in appearance. Flower heads have around 13 bracts at their base with dark tips. Leaf Description: Leaves are twice divided, with petioles on leaves near the base and without petioles toward stem tips. First year leaves in a basal clump (rosette). Second year leaves are alternate along the stem, 1.6 to 7.9 inches long by 0.8 to 2.4 inches wide. Stem Description: Stems reach up to 4 feet tall, numbering one to many from roots. They branch near their tips. Fruit/Seed Description: Seeds are sparsely hairy to glabrous (hairless and smooth). 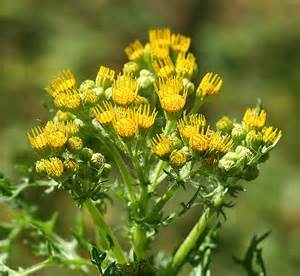 Tansy ragwort is toxic and a threat to livestock and agriculture. All plant parts are toxic, with the highest amount of alkaloids in flowers then leaves, roots and stems. Toxic properties are a possible threat to humans through food chain contaminants.